San Francisco's accordion-fueled rock 'n' roll band pumps out quirky, catchy originals chronicling life in the weird lane. 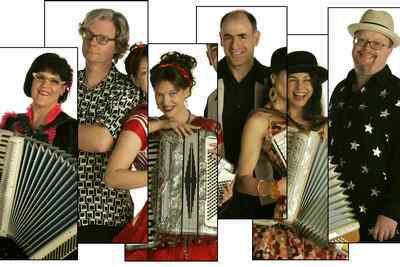 The six-piece group -- fronted by lead singer/squeezebox wizard Paul Rogers and bellows-pumping babes Carri Abrahms, Susie Davis and Suzanne Garramone -- promises to forever rearrange your understanding of the accordion. TDA's four extreme squeezeboxers mix solid keyboard chops with a groundbreaking use of guitar effects pedals and amps to produce a super-cool sound like nothing you've ever heard emanating from an accordion. With sterling vocal harmonies and a sense of humor that just won't quit, the one-of-a-kind band blazes through a variety of musical genres -- from rock and funk to polka and even swing -- and torches timeless classic rock tunes along the way. You won't believe your ears.